Peanut butter and bananas are a perfect couple. They’re like eggs and toast or cookies and milk. Sure, you could eat one by itself, but they only reach their full potential when consumed together. One of my favorite sandwiches is the peanut butter, banana, and honey sandwich. Apparently, that was Elvis Presley’s favorite sandwich as well. 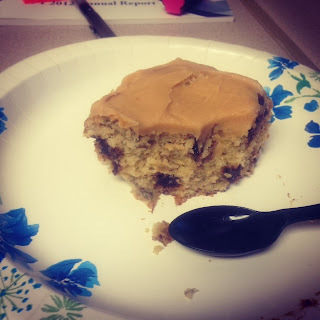 The cake recipe came from food.com and the peanut butter frosting recipe came from Betty Crocker. The ingredients for the banana cake are 3 bananas, 2 teaspoons lemon juice, 3 cups flour, 1 ½ teaspoons baking soda, ¼ teaspoon salt, ¾ cup butter, 1 ¾ cups white sugar, ¼ cup brown sugar, 3 eggs, 2 teaspoons vanilla, 1 ½ cups sour cream, and 1 cup chocolate chips. The original recipe doesn’t call for chocolate chips, but chocolate chips make everything better. I began by mashing the bananas and lemon juice. In another bowl, I combined the flour, baking soda, and salt. This recipe requires a few bowls, which is a shame if you don’t have a dishwasher. In yet another bowl, cream the butter and two types of sugar. The original recipe only uses white sugar, and that was my initial plan. While making the cake, I realized I only had 1 ¾ cups of white sugar, so I made up the difference with brown sugar. The original recipe also calls for 2 1/8 cups of sugar, but I don’t think the last 1/8 cup of sugar is too essential. I added the eggs one at a time, thoroughly mixing between each addition. I added the flour and sour cream after the vanilla. I alternated between adding the flour mixture and sour cream. After adding a third of the dry ingredients, I added half of the sour cream. The last think I added was a third of the flour. I mixed after each addition. I hope that is a clear explanation. Here I am mixing in a third of the flour mixture. This is half of the sour cream. The last of the sour cream is added and mixed in. Once the flour and sour cream was combined with the creamed sugar and eggs, I added the mashed bananas and chocolate chips. I poured the batter into a greased 9 by 13 inch pan and baked for an hour at 275 degrees Fahrenheit. As you can see, the banana cake fell in the middle as it cooled. It was a disappointment, but the cake was still rich, moist, and delicious. I did a little research on why cakes fall, and there are several possibilities. If you are in high elevation, you need to make adjustments to recipes. I am close to sea level, so this isn’t an issue. Old baking powder is another possible problem. Another blog said that using too much baking powder could cause a cake to fall. A more technical blog said that if there is too much butter and sugar to flour and egg, the starch and proteins aren’t strong enough to hold the air as it expands during baking. This blog also stated that if the temperature was too low, the baking powder starts to leaven the cake before starches have set enough to hold the air. In short, there are like a million possible reasons why this cake fell. When I remake this, I’ll check the expiration date of my baking powder and increase the temperature by 10 degrees. As I mentioned the frosting recipe came from Betty Crocker. I divided the recipe by half, which was just the right about for a 9 by 13 inch cake. The ingredients for the frosting are ½ cup butter, ½ cup creamy peanut butter, 2 cups powdered sugar, 1/8 cup milk, and ¼ teaspoon vanilla. I began by beating the butter and peanut butter together. My peanut butter was natural and a little more runny than other brands. I then mixed in the milk, vanilla, and ½ a cup of powdered sugar. I gradually added in the powdered sugar, mixing thoroughly after each addition. I kept adding powdered sugar until the frosting had reached the appropriate consistency. I then spread the icing on the completely cooled cake. This cake was fabulous. As I have mentioned before, banana and peanut butter are a delightful couple. It is impossible that the original icing recipe pairs with this cake as well as peanut butter frosting. I brought this cake to work, but I still ended up eating so much of it. This is not a good recipe if you are trying to watch your sugar intake, but it is a great recipe if you want something decadent but homey.